The women backpack purse is made of high quality soft faux leather and thick chrome steel hardware,heavy duty zippers and fabric lining which is stylish and durable.With the well-thought structure and removable shoulder strap and top handle,you can carry it as a single-shoulder bag with the shoulder strap or backpack.It is a perfect leather backpack for girls and women who go to college,shopping,travel or work. 2 zipper pockets on front for your daily use. 1 back pocket to keeps your valuables. 2 side pockets for water bottle, umbrella,sunglasses. 1 large main zipper pocket fits up to 9.7" iPad Pro, tablet or a laptop 10"
3 open pockets and 2 zipper pockets for values and keep your things organized. Material: High Quality PU Leather, water resistant which is durable and easy to clean. Detachable shoulder strap( total length )59cm/23.23". Warranty:Ravuo provides worry-free ONE YEAR warranty,if you have any problem about the product,just free to contact our customer service. 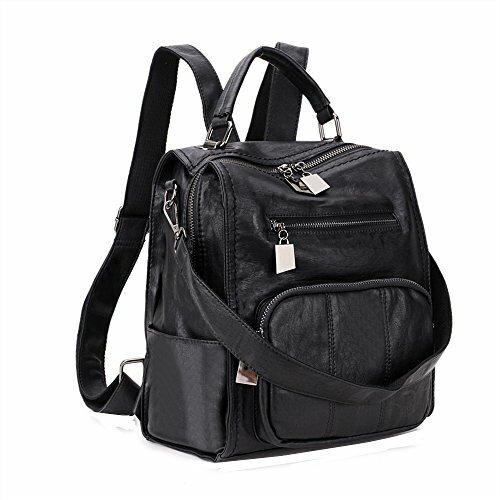 ✿Premium Quality Fashion Backpack-The women backpack purse is made of soft synthetic leather and thick anti-silver hardware which is stylish and durable.With leather and anti-silver hardware,this fashion backpack handbag is the perfect choice to your favorite casual looks. ✿Easy To Organize-Large capacity with 10 pockets to keep all of your stuffs in organized.External with 2 zipper pockets on the front,1 anti-theft back zipper pocket to keep your valuables ,2 side pockets for water bottle,umbrella.Internal with 1 main zipper compartment which could hold a 9.7" iPad, tablet or a laptop 10", 3 slip pockets and 2 zipper pockets keep your things organized. ✿Dimensions-11.81"L x 9.84"W x 6.3"H/30X25X16cm.Weight:0.85kgs/1.87pounds.Adjustable backpack straps:21.26"-38.58"/54-98cm.Handle drop:4.33"/11cm.Detachable shoulder strap:23.23"/59cm. ✿3 Ways to Carry-This leather backpack features top handle, a detachable shoulder strap and adjustable back straps.You can carry it as a handbag,shoulder bag and backpack for any occasion.The zippers are smooth with extra long puller for easy open and close.The reinforce handle and enhanced back straps(fabric stitching with leather)designed to make the strap more sturdy and non-slip.This cute and chic woman shoulder bag with removable shoulder strap fits for shopping,traveling,working,dating. ✿Quality Warranty-Ravuo provides worry-free ONE YEAR quality warranty,if you have any problem about the purse,just free to contact our customer service.It is a perfect women's fashion bag,school backpack bag,travel bag,perfect gift for your girlfriend,daughter,mother and colleague.